Maybe I should try a new Garmin? Mine was purchased in 2008. 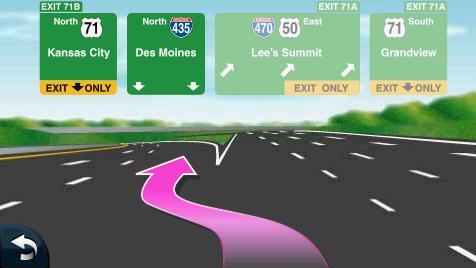 Junction View is one of the best features of modern GPS. Do the newer ones INCLUDE updates, rather than charging for for the updates than a new device? Most new Garmin portable GPS come with lifetime map updates. Unfortunately, this doesn't apply to the Garmin-based navigation in my Jeep. You can check the link if you are interested. I also have the Garmin app on my iPhone and it is updated free on a regular basis. Yes, many of the Garmin products come with lifetime maps and some come with lifetime traffic. On Garmin I think this is designated by LM or LMT on the model number suffix. I like the idea of LMT. This is the feature that finally made me want to purchase a GPS. Other brands of GPS also have lifetime maps and some with lifetime traffic. Keep in mind, products will become obsolete in a few years regardless of whether you purchase a model with LMT. At some point the software and hardware will not work properly with new map updates, they'll become slow, new features on new models will be much more desirable compared to the old products. Lane assist shown in a post above is also a useful feature that made me want to finally purchase a GPS. Lane assist works relatively well but is not infallible as I mentioned in an earlier post. I loaded the Garmin smart phone app that allows our iPhone to interface with the GPS via Bluetooth. Haven't used it much yet. I'll report back when I've had a chance to test it in more detail. I have been using this technology for a long time and I am continually amazed at how accurate the junction view is, including the correct number of lanes and the exit signage. The weather features have helped me avoid unexpected encounters with heavy weather and I have been thankful to have had that real time information available on many occasions. Traffic information is OK,but is often out-of-date, but I have found that for real-time traffic information on Waze is very accurate and timely. If you are looking to trip plan on a big screen, then you can plan your entire route in Google maps and then send the track to your phone with the messaging app, that's what I learned on my trip back to Boston from Zion. m.hony maybe nvestysly will sell you his Garmin with lifetime maps, once programmed up with all your RV parameters it works really well for it's purpose. We use the Navigon app on out iPhones. Updates are slow but free. Our typical trip involves using the Navigon app to get to our first critical stop, which is the nearest Cracker Barrel. Then I grab their latest paper map and do en-route navigation with that so we can eat. The phone gets us to the campground locally. I do pre-plan the trip for mileage, locations, reservations, etc and put that set of printouts into the trip binder. I also hit AAA for a triptic, tour books, and detailed paper maps just because I like to be a redundant member of the redundant department of redundancy. Occasionally getting lost is considered an adventure, as long as we have gasoline. Hi, I bought the Garmin RV 760 for my new truck. I left my Garmin 1490 in my Lincoln. The Garmin RV 760 is way smarter and has much more usable information than my previous GPS. I also bought mine as a package deal with a 50' cord and a wireless backup camera. I have recently managed to install the backup camera and think it will work great. On another thread, I show what I had to do to get it to work the way I want it to. Now my truck has a backup camera that has a dash screen and a trailer backup camera that shares that GPS screen. I would highly recommend this GPS. A few years ago I purchased a used GPS for my wife's motorcycle and the original owner sent Garmin an email, afterwards I was able to register the GPS and was thus able to update the maps. As somebody mentioned as technology moves forward sometimes the updates won't take (in most cases this is due to size). On this particular GPS that meant downloading the map update to the computer, which I do anyhow, then using the Garmin Map loader software and selectively picking out different parts of the US to install on the GPS. Not nearly as elegant as having it automated, but it works. I was recently annoyed by a GPS I bought as a replacement because it was one designated as LMT. Being LMT, I would have assumed it was Lifetime Maps and Traffic. In fact, it was. However, because Garmin now is trying to figure out how to continue to maintain revenue streams, they no longer included the traffic module in this particular model. Instead you got a standard power cable and had to spend another $60 USD to get the traffic module. Traffic is very helpful where I live, so I ended up buying it, but definitely wish they would have stated this up front. I have been through the obsolete issue with Garmin, most recently my Streetpilot. But I do like my RV760 and the RV features. Without lifetime maps, I would not consider a Garmin, with lifetime maps it is the only one I would consider. I especially like the ability to plan my trip on my PC using Basecamp, specifying the speed, then download the trip to my Garmin and my tablet. I never have figured out how to change speed parameters in Google maps plus Garmin has almost everything camping in the database.